In addition to water and nutrients, oxygen is essential to healthy deep root growth and therefore healthy trees. Just as inadequate water will eventually kill a tree, so too will excessive , unless it is drained effectively. It fills the voids between soil particles and deprives the tree of oxygen, over time ‘drowning’ the roots and killing the tree. Compacted soil can be as disastrous for trees, restricting both oxygen and water. In the natural state, the most abundant supply of water, nutrients and oxygen are usually found in the surface layer of soil. In general as depth increases, soil compaction increases and the availability of water, minerals and oxygen all decrease. Water may be available at greater depths if rainfall is high, ground water is available or is moving horizontally through sandier soils from water sources. Oxygen may also be available at depth if the soil is not compacted and the action of earthworms has created tunnels through which oxygen can flow. 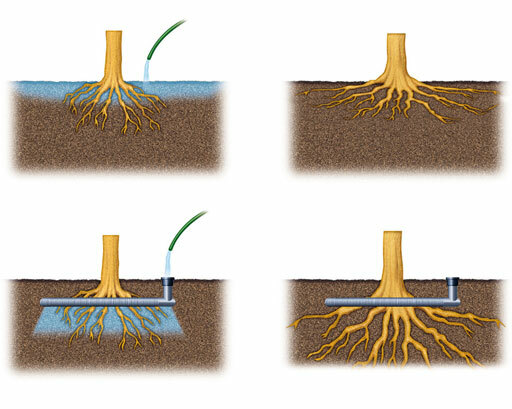 Tree roots will grow near the surface unless adequate water and air is available below ground. One method for providing the necessary water and air to the tree roots involves the use of a perforated flexible piping system. At the time a tree is being planted, the pipe may be looped around the rootball within the immediate rooting zone of the new tree, and also in the outer rooting zone (in treepits) looped throughout the root cell matrix. The pipe is then connected to an inlet located at the tree pit surface. This method may be adapted for use beside roadside verges and open space tree planting or in heavily trafficked areas. The inlet enables a hose to be attached when water is needed. The rest of the time the pipe, being looped in a circuit, allows air to flow passively through the system and around the roots of the tree. Changes in air pressure above ground are also accommodated. This arrangement enables long deep watering over the entire root system and the opportunity for the soil to dry between watering, which is better for trees than frequent light watering. Implement and monitor an advanced treepit system with funding, design and installation support. 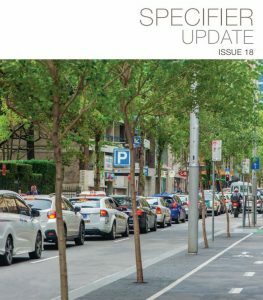 Get up-to-date on new Citygreen projects, featuring innovative urban tree installations around the world. Become an accredited Citygreen installer by completing our comprehensive online training. Receive the latest case studies, project reports, research articles and news by completing this form to join our newsletter. Learn from the experts. A sustainable way to stay in touch.